When you want someone to look after your child, parents or anyone who belongs to you, their caretaker will ask you to fill in the medical consent form. With this form, the caretaker is given the authority to provide the necessary medical treatment. What is medical consent form? 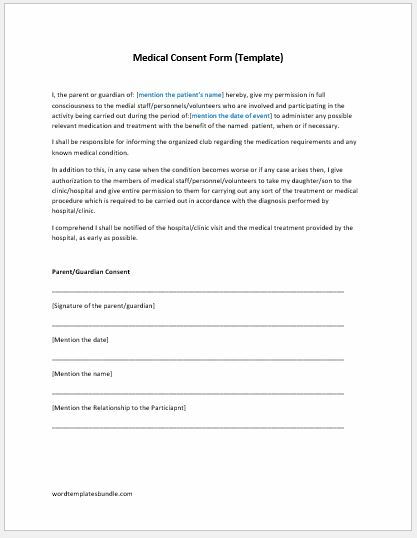 The medical consent form is such a document which is used by caretakers to get the permission from the guardians of a child to provide him necessary medical treatment. This form is usually used by parents when their child to be given necessary medical treatment in their absence. When to use the medical consent form? You can use this form when you want to limit the type of medical treatment to be given to your child or parents. The main purpose of using this form is to ensure that the child is being given complete and proper care and the type of treatment is also satisfactory. With the help of this document, the details of the permission can be specified. This form allows the caretaker of the child to take necessary decisions on behalf of child’s parents. Because there are varieties of medical needs, you are required to choose the caretaker with care. With the help of this form, one can easily make sure that their child is getting proper care even in his absence. The name of the person who is authorized to provide care to the child can also be mentioned in the form that can be challenged anything in future if the instructions in the form are not followed properly. I, the parent or guardian of: [mention the patient’s name] hereby, give my permission in full consciousness to the medical staff/personnel/volunteers who are involved and participating in the activity being carried out during the period of:[mention the date of event] to administer any possible relevant medication and treatment with the benefit of the named patient, when or if necessary. I shall be responsible for informing the organized club regarding the medication requirements and any known medical condition. In addition to this, in any case when the condition becomes worse or if any case arises then, I give authorization to the members of medical staff/personnel/volunteers to take my daughter/son to the clinic/hospital and give entire permission to them for carrying out any sort of the treatment or medical procedure which is required to be carried out in accordance with the diagnosis performed by hospital/clinic. I comprehend I shall be notified of the hospital/clinic visit and the medical treatment provided by the hospital, as early as possible.